Willoughby Sofa Don’t go neutral—go natural. Inspired by nature’s beauty, the Willoughby sofa is a breath of fresh air. Aqua upholstery livens up your room, and the patterns on the accent pillows add more colors to the mix. At the heart of the Willoughby sofa is a contemporary design that makes it feel current—live in the moment with track arms, tapered feet and the neatly tailored look of piping. Its inviting looks will make your guests feel right at home. Don’t go neutral—go natural. Inspired by nature’s beauty, the Willoughby sofa is a breath of fresh air. Aqua upholstery livens up your room, and the patterns on the accent pillows add more colors to the mix. At the heart of the Willoughby sofa is a contemporary design that makes it feel current—live in the moment with track arms, tapered feet and the neatly tailored look of piping. Its inviting looks will make your guests feel right at home. I love this couch and the comfort, but the cushions constantly move and it is a nuisance. Is there anyway to keep them in place. We were very excited with the purchase of two of these couches--one as a sleeper sofa. We thought for the price they were sharp looking and comfortable. Unfortunately, about 6 months into our purchase both couches are showing signs of excessive pilling and shredding. We bought a mirco fiber couch at R&F at the same time and using in the same room which shows almost no signs of wear. We have had very good experience with R&F over the years, but are very disappointed with this purchase. I loved this sofa (we actually bought the loveseat) but the side my husband sits now has collapsed cushions after only eight months, making it uncomfortable to sit there, and the seat cushions do not stay in place, constantly moving forward and falling off if you are not comfortable. The color is beautiful, but I am disappointed in the product. We love the color and design. We have always purchased our couches at R&F and quality has always been amazing, until now. The stitching and seams are crooked, the cushions are over stuffed and different sizes and the bottom cushion never stay in place. F&R has been helpful, but I think we will ask for a different set because to have 3 different pieces of furniture because nag defective is not a coincidence. I hesitated a bit about choosing an aqua sofa-but after a visit to the store, I couldn't resist. It is a woven fabric with cream running through it which marries perfectly with light taupe & grays. Also purchased side chair in matching pattern & love that pillows are included. Salesperson was great, delivery was prompt. My living room has been transformed! I have owned this sofa for 9 months and I can honestly say it looks like I've owned it for 9 years. The center cushion has collapsed, it is very uncomfortable, and unsightly due to the loose wrinkled fabric. This makes the couch look like it is sagging in the middle. In addition, you can't keep the cushions on the couch because they keep sliding off every time you get up. Don't be fooled, this couch looks good, but it doesn't stand up to the test of time. There is something fundamentally wrong with the design of this couch that R&F and the manufacturer should address. love the look, it brings color to my very white apartment. sofas go well with anything wood. I've had the sofas for little less than a year and although i love it, they aren't lasting very long. the cushions are depleted, and they have fuzz/lint balls on the cushions. if you aren't going to sit on them on a daily basis then these sofas are perfect for you. We are so pleased with our sofa. The color makes all the paintings, carpet come to life. Most important , it is so comfortable I find myself napping more frequently. This couch is comfortable and looks terrific. The color is more muted than the picture shows--so check it out in the store or order a swatch. The Willoughby Sofa fit the color, size, comfort, price and time frame of what I needed in a sofa. I needed this sofa within 3 days for a business meeting and they delivered on time with no problem. This sofa is firm, yet comfortable. It came with 4 pillows where most sofas only had 2. I like how the back cushions are sewn to the sofa. The delivery guys easily & carefully brought it up the stairs without banging it against the wall. Great job! Have had the for 2 years and it looks like it's 20 years old. The seat cushions constantly move and the back cushion filling is collapsing. The seat cushions starting pilling after about 6 months. I so regret buying this couch. I love my sofa. I have no problems with it. Just what I was looking for. I would recommend to my friends. Sturdy, very comfortable, high off the floor, just perfect for our family room! My girlfriend and I furnished a new apartment and this ties in nicely. For having a large-ish appearance, it fit through our narrow door (door is approx 28.5" wide) and takes up just the right amount of space in an area that's roughly 13' x 16'. The pillows that come with it are not my style, but we're using those on the guest bed. Overall, two big thumbs up! I just received my sofa and really like how comfortable it is along with the pillows. I received a great deal on the price that was unbelieveable. The only thing I would like is some way to keep the seat cushions in place. I will add may some velcro to the bottoms to hold them in place. Other than that I am very happy with this purchase. Nice comfy couch! Naps are awesome here! This couch is great. I love how comfy it is for naps. And love the color, and the pillows it brings. Fabric is smooth and it's just a nice couch. Love how tall it is to sweep under without trouble. My Bob sweeper goes right under it. And when sitting up straight on the couch you can lean your head back comfortably and it feels like your head is on a pillow. Cushions are great! Overall great couch. But I'm just disappointed with the way the manufacturing is. Such as some stuff isn't attached well or sown well. I don't know if it's on purpose but doesn't seem like it because you can see what's not supposed to be seen. It's not visible if you don't go looking but I think they should really construct better. I got this couch swapped, meaning I gave back the initial one I bought because of the manufacturing issues and damage upon delivery and Swapped for this one and see the same construction issues. So that's my only issue. But you get what you pay for. But the couch is awesome. Disappointed in this item, the cushions do not stay in place when you sit on the couch, you constantly have to keep pushing them back onto the couch, not very comfortable to sit on. Looks fine but no if you use everyday. I purchased this couch in December of 2016 and I am already in the market for a replacement. This sofa is extremely uncomfortable, and pills like no ones business. The cushions are uneven and fall off. At this point the sofa is just unsightly and I am embarrassed to have guests over. I only gave an extra star because the color is really pretty and the pillows are nice. We purchased this sofa no more than 2 years ago. No rough housing on the couch or anything. Today one of us sat on the sofa and heard a loud snap. You can see it had snapped in the middle, because now the fabric is warped and pointed downward due to the break. Now we're afraid to sit on it, and it certainly wasn't purchased with the intent of becoming a decoration in the living room. Poor construction, after a few months of purchase seams on cushion ripped, R&F repaired by sowing it together. After one year seams ripped again and my sofa looked like it was 10yrs old. R&F instead of giving us a credit they just replaced with same sofa. I have had it for a month and cushions already look slummed. Here we go again, disappointed with sofa and R&F. Please do not buy. I love the sofa, very comfortable, the quality and the offer the customer service gave me to buy it. The sofa is perfect for my living room and match to the frames I have also I purchased side chair in matching pattern and it looks great and elegant in my living room. Thanks for the commitment and loyalty in good products to your customers. I purchased the sofa and love seat. The color is beautiful, the fabric durable yet smooth to the touch. They look far more expensive than they were. They are substantial and fit beautifully in our living room. I purchased this sofa and matching chair. I really like both. Love these pieces and love the color. Sturdy yet comfortable. Got a great price and the delivery was excellent.Salesman Mr Hall was great! I like that the back cushions are attached to sofa frame. Bottom cushions do shift around slightly but not enough to be a hindrance. I do enjoy that it's a taller sofa when sitting on it. Color looks great in person, when taking pictures it looks more green or more blue depending upon lighting. After years with large dark traditional, we are thrilled with our purchase! Sturdy, reasonably priced, easy care material (think pets!) the room is so much lighter and calming without being 'contemporary' (not our style LOL). We will be back for the coordinating chair soon! Love the design, love the comfort, love the size! We bought love seat and one of the chairs too. Our living room looks bright and inviting. Very happy with purchase. The color of this sofa was perfect for our new living room. I'm hoping it durable as well! It is the "bed for our labrador retriever"! Thank you! Really like this couch. Perfect for our living room and it has just the right pop of color. This fits perfectly in my small living room. The color is unusual, like a retro blue, but goes very well with the chair suggested as a pairing. I have purchased the sofa and loveseat for my living room which has a Sesame/brown rug. It looks great and has good support. Love the 4 pillows that come with both sofa and love seat. I'm hoping to purchase the accent chair soon. This sofa looks great - nice, simple lines, and in a color we wanted. It arrived quickly. It's great to be able to flip the seat cushions, too. Unfortunately, the seat cushions do not stay in place. Every time the sofa is used the cushions move forward, leaving a gap. This not only looks bad, but it will eventually lead to a breakdown in the cushion. The fabric is starting to pill a bit, even though we keep it covered when we do not have guests. I think the sofa will be OK for a few years. You get what you pay for, so if you want a nice looking sofa for a couple of years, and you don't mind constantly pushing the seat cushions back into place, it might work for you. This sofa looks very good - really sturdy. It can be uncomfortable specially during the summer. The clothing is not very soft - we have it for almost 6 months now. We have to use a sofa cover to feel soft. Spend a little more for a higher quality sofa that will last longer. I was wary to buy bc it was the least expensive sofa and loveseat set that I liked. But I loved the color and look so we took the chance. The sofa pills, the coushins don’t stay in place and the pillows are flat and cheap looking. We have had it a little over a year and are already talking about replacing it! Product is poorly designed and I would not recommend that anyone buy it unless it is just for show or occasional use. Very dissapointed with this sofa! It is about 3 years old now and looks 10 yrs old. Received service for the cushions (new foam), but it remains uncomfortable and makes you slouch. I need a new sofa and love seat at this point. Beautiful couch, but the frame broke after 26 months of light use. Manufacturers warranty is only 12 months. That should have been a red flag. We're very sorry to hear about this experience and would like to look into this for you. Could you e-mail your order details and contact information to rfcare@raymourflanigan.com so we can better assist? Thank you! I just purchased my first new couch and absolutely love it! My sales gentlemen was wonderful as well, he didn't pressure me, offered valid information. I highly recommend purchasing from Raymour! I really needed a new sofa, and this one was perfect! I love the colors, the accent pillows, and the matching accent chair. It has a nice firm feel, but the back area is very soft. I imagine after using it for some time, the firmness will get a bit softer as well. The sales representative that helped me find this sofa was very patient and thoughtful, answering all my questions and concerns with care. I definitely trusted his judgement once I felt the sofa for myself. The delivery was right on time and I was excited to get my couch! So far, I'm very satisfied with my sofa. The only thing is that the pillows keep moving and I always have to put them back in place. It's a bit annoying, but the quality and price of the product were great. The color is perfect in our living room - very comfortable and we are enjoying it very much. Salesman was very helpful and not pushy or overbearing. our recent purchase was very good. We are enjoying our new furniture. Thank you for the great service. Very happy with my couch and even happier with the price. The delivery men were prompt, professional and courteous. While looking at product reviews for the Willoughby sofa I noticed there is one review with 1 star and one for 2 star. I would like to see those reviews before I decide whether or not to purchase the sofa and matching loveseat? Thank you. BEST ANSWER: All reviews are all on the Willoughby Sofa website under the Product Reviews section. Are the legs removable? How wide and how high a doorway for delivery of sofa? How do you keep the cushions from sliding forward? BEST ANSWER: An option to keep the cushions from sliding forward would be to apply Velcro to the bottom of the cushions. We tried the velcro and it did not work. are the cushion covers removable? BEST ANSWER: The covers are removable. BEST ANSWER: The upholstery on the Willoughby Sofa is not a chenille. It is blend of 52% olefin / 48% polyester. It is a durable fabric with a very tight weave of the teal blue with white threads running through when observed very closely. Does this sofa come in leather? BEST ANSWER: The Willoughby Sofa is not available in leather. Are the back cushions attached? Do the seat cushions have springs, and are they reversible? My current sofa is a piece of junk, whose cushions disintegrated and springs sprung in less than 3 years, and they are NOT reversible, so I cant even flip them over. Back cushions are attached so I can't put a sofa cover on it. BEST ANSWER: The Willoughby has 1.8-lb. Density, fiber-wrapped, foam seat cushions and are reversible. Additional details can be viewed by clicking on the "Features & Benefits" title to expand the section. The back cushions are partially attached. At about the half way mark. This gives them the pillow look and feel, but stay in place. Yes the seat cushions are reversible, but they don't have springs in them. will you remove old sofa ? BEST ANSWER: Raymour & Flanigan does not offer service for removal of old furniture. What company made willoughby? Where was it made? BEST ANSWER: The Willoughby Sofa is made by Fusion Furniture in Mississippi. Is this couch comfortable? 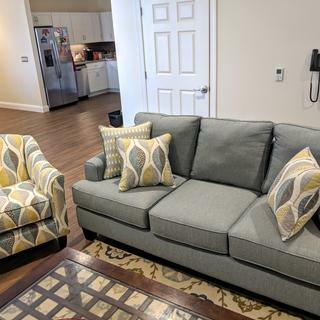 The cushions look pretty stiff in the picture and there are no reviews. BEST ANSWER: The Willoughby Sofa has 1.8-lb. Density, fiber-wrapped, foam seat cushions, which is a standard density. It is comfortable. do you sell just the throw pillows for this set? BEST ANSWER: The pillows are not available for individual sale. Is there an area rug that you would suggest to put with the couch and leaf patterned chair? BEST ANSWER: Hello Linda, any neutral shades like beige, gray or brown would pair nicely with the Willoughby collection. I have wall to wall carpet so i never considered getting an area rug. Are the armrest removable to fit into my small door? BEST ANSWER: Armrest not removable. Legs are removable and was removed to fit through my apt size small door. This collection does not come with an ottoman, what suggestions do you have for an ottoman that will match in color and height? BEST ANSWER: I use a light colored wooden one that has a green pad on it and it looks good. Many different colors would match. I think gray or camel colored leather would work. I love this couch, it’s super comfortable and stains come out easily. I loved this collection but unfortunately we returned it because they couldn't get the 3 seater in through the door. I would do a coffee brown leather ottoman. You can't go wrong with that. It is a match with anything. can I get the Willoughby in an "L" shape? are there other colors it comes in? do you other "L" shaped sofas to look at? BEST ANSWER: Hello Steven, thank you for your interest in the Willoughby Sofa! This collection does not offer a sectional "L" shaped sofa. We do offer a variety of sofa chaises and 2-pc. sectionals. The Willoughby Sofa is available in the Aqua color as shown only. Are the cushions on sofa and loveseat made with memory foam? If not can I special order memory foam cushions? BEST ANSWER: Please contact our online sales department 866.383.4484, option 3. There is where we will be able to best assist you with any questions about products and special orders! Can I purchase fabric that matches the throw pillows? BEST ANSWER: Additional fabric from the Willoughby collection is not available for purchase. Want the couch. If I don't like the way the loveseat looks when it's delivered can I send it back to the store? BEST ANSWER: The loveseat can be returned with the delivery team if it does not meet your satisfaction. Does it come in other fabric and color choices? BEST ANSWER: The Willoughby Sofa is available in the Aqua color as shown only. BEST ANSWER: The manufacturer is Fusion Furniture.